Most people have questions about nitrous injection before deciding that a Wizards of NOS nitrous system is the right tuning upgrade for them. Whilst the Wizards of NOS are happy to answer any questions to ensure all potential customers are well informed, many questions are asked so frequently that we've listed them below, along with the relevant answers. Please bear in mind that even if the information here contradicts what you already believe to be the case, this information comes direct from the world's leading nitrous injection expert and is therefore 100% correct. * In the text below we use the term NOS as an abbreviation for 'nitrous oxide systems'. We only use this term because it is the most commonly recognised generic term and it is not used as reference to the NOS product brand. Will NOS / nitrous oxide injection damage my engine? What is the best compression ratio to use with nitrous injection? Will using a NOS nitrous oxide system wear my engine out quicker? Are Wizards of NOS Nitrous Oxide Systems legal on road cars? What tests can I do to ensure my engine is in a good condition prior to fitting a nitrous system? What modifications will be necessary or beneficial before fitting the system? Does my plug gap need to be altered when using nitrous and can I use my existing plugs? Can nitrous injection be a constant source of power? How long can the system be held activated for? Can I activate the Nitrous Oxide System at any time under any conditions? Will my catalytic converter be a problem? Where can I buy nitrous oxide from? Can nitrous systems be used with automatic transmission / gearboxes? What is the difference between Nitrous Oxide and Nitro or are they the same? What is a progressive nitrous controller and do I need one? What do the metering jets do? 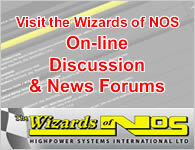 Why do Wizards of NOS use nylon line? How does nitrous bottle pressure affect my performance? How much extra nitrous power can my engine handle?